Flora!! 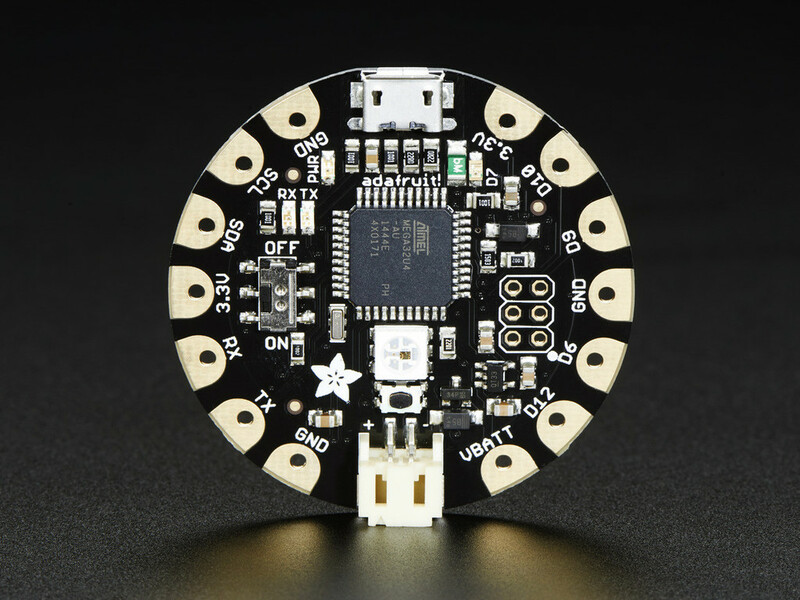 – Best wearable electronic platform – fully featured, sewable and Arduino-compatible microcontroller. It has 1.75″ diameter and weighs 4.4grams. For power, it has an on-board JST connector with protection diode so that you can use with external battery inputs 3.5V to 16V DC – can be controlled on/off via on-board power switch. There is 3.3V 250mA regulator with protection diode for consistent voltage and also to power up other 3.3V modules and sensors. It features built-in USB support via Micro-B USB cable and also USB HID support so it can act like a keyboard or mouse to attached directly to computer. The Flora family also includes stainless threads, sensors, GPS modules and chainable LED NeoPixels and accessories for Flora main board.